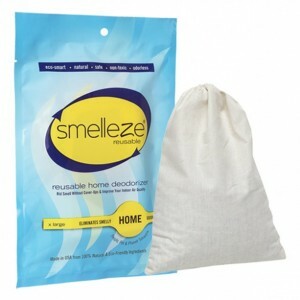 SMELLEZE Natural Vomit & Smell Absorbent: 2 lb. Granules Stop Puke Odor Summary Smelleze® Eco Vomit Absorbent and Smell Removal Powder absorbs vomit & remove vomit smell without harmful fragrances. Nasty vomit odor doesn't stand a chance. Safe for people, pets & planet. This eco-friendly vomit and odor removal deodorizer and absorbent really works well & is a great remedy for vomit cleaning! Features & Benefits • Simply sprinkle on vomit & smell the difference • Absorbs vomit spill & odor in minutes • Eco-friendly, safe, non-toxic, natural, odorless • Significantly improves indoor air quality • Creates a cleaner, healthier, odor-free environment • Made in USA Absorb & Eliminate Vomit Odors Safely Residential, school and commercial facilities such as hospitals, day care facilities, cancer treatment centers and nursing homes frequently encounter unpleasant vomit odors. 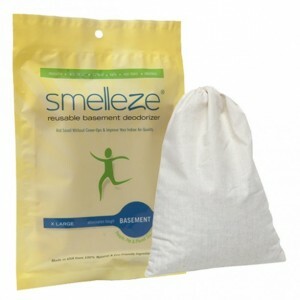 The Smelleze® Vomit Absorbent & Smell Removal Powder was specially developed to absorb, neutralize and encapsulate vomit and pungent odors on contact without masking them with fragrances. For a breath of fresh air, simply sprinkle enough Smelleze® Vomit Absorbent & Odor Removal Powder on the vomit to adequately cover and absorb it to form a solid. Then sweep it up, dispose, and smell the difference. Repeat this process if any vomit still remains. Thereafter, wash the affected area and sprinkle Smelleze® Vomit Absorbent & Smell Remover Powder on it, leave for a few hours or overnight and vacuum. Repeat, if necessary, until all the odors are eliminated. Smelleze® Vomit Absorbent & Odor Remover Powder can be effectively used on beds, coaches, upholstery, floors, carpets, bedpans, medical waste disposal pails, garbage cans, etc. Smelleze® Vomit Absorbent & Smell Control Powder is non-toxic, safe, recyclable, natural, odorless, non-flammable and non-caustic. Smelleze® Vomit Absorbent & Odor Control Powder is an ideal environmentally friendly solution for absorbing vomit and associated vomit odors without adding pollutants to the air you breathe. It does not contain VOCs, harmful or ozone depleting chemicals and is especially beneficial for those suffering from allergies and chemical sensitivity. No fossil fuels are used in the production of Smelleze® odor eliminator deodorizer media.